The glebe house at Killeevan, County Monaghan: the church where its occupant would have taken services stands close by. The core of clerical residence is believed to date from c.1800and the handsome bow certainly suggests an early 19th century date. It was described by Samuel Lewis in 1837 as a ‘neat building’ but sadly that is no longer the case, despite the structure being listed for protection. The former Wallace’s Mills at Kilcran, County Monaghan. Dating from c.1790 this substantial range of stone buildings offers evidence of the country’s industrial past. The long range to the left operated as a corn mill while that to the right was a scutch mill, driven by water and used in the manufacture of linen to remove impurities from flax fibre through by means of rotating wooden blades. Seemingly it was customary to have the two manufacturing processes – for food and fabric – operating from adjacent premises. Located down a quiet side road, what use now for these substantial properties? 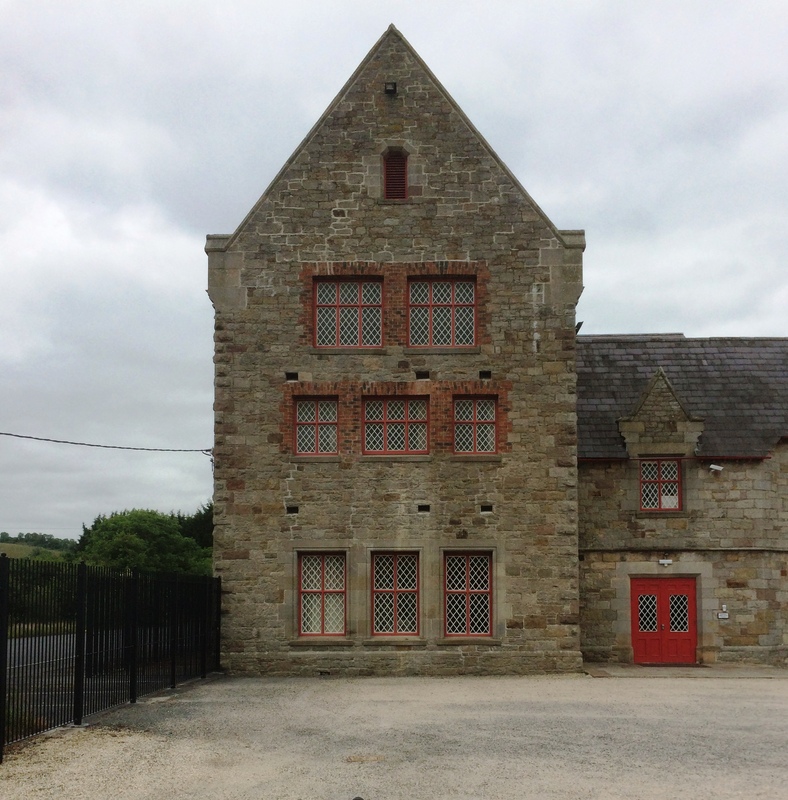 Bowelk, County Monaghan is one of a number of houses built by the Jackson family, members of which developed the linen industry in this part of the country from the last quarter of the 18th century onwards. The business’s prosperity allowed them to buy land and construct residences such as this one which according to surviving evidence in the house dates from the 1850s. Bowelk has been carefully restored in recent years by new owners keen to preserve features such as the main doorcase with its elliptical fanlight and side lights filled with ornamental leadwork. Not yet restored but still intact is a thunderbox tucked into one corner of the adjacent walled garden, the door of which retains its decorative fretwork. How fitting that this week’s funeral of Captain Sir John Leslie, otherwise universally known as Jack, should have taken place in glorious sunshine, the same kind he shed on so many peoples’ lives. Jack died last Monday just eight months shy of reaching his centenary, having been born in December 1916. Over the course of ten decades he witnessed many changes in the world but somehow still behaved as though it was much the same as that into which he had emerged: I remember on the first occasion we met our conversation turned to the Romanian author Princess Marthe Bibesco, and he produced a book she had given and signed to him. His own memoirs, Never a Dull Moment, written ten years ago are full of entertaining reminiscences and suggest a personal history untouched by setbacks or misfortune. Of course this was not the case, as evidenced by Jack’s experience during the Second World War. Commissioned in the Irish Guards, he and his platoon crossed to France in May 1940 where they were almost immediately captured by the German army: Jack spent the next five years in a Bavarian Prisoner of War camp with all its attendant privations. Although he returned to Ireland on his release and was expected to assume responsibility for Castle Leslie, within a few years Jack left again, eventually settling in Rome where he occupied a small palazzo in the Trastevere district, as well as embarking on the restoration of an ancient monastery outside the city, the Badia di San Sebastiano di Alatri. Some twenty years ago he finally came back to Castle Leslie, by this time in the care of his niece Sammy Leslie, and settled down as resident guide and anecdotalist, always delighted to engage with visitors and explain the history of his family and their property. In later years Jack also became well-known for his fondness for nightclubs where he would energetically dance to what he liked to call ‘boom boom’ music. I accompanied him on these expeditions more than once, initially in the self-appointed role of chaperone. However, like everyone else I discovered he was invariably received with wild enthusiasm, and would soon be surrounded by a coterie of solicitous admirers, on average only a quarter of his age. But there were other instances, notably a tea held in his honour some years ago at Bellamont Forest, where Jack demonstrated older forms of dancing: supported by a sixteen-piece band, that afternoon he gave a lively demonstration of the Black Bottom. So one likes to remember him, light of heart and light of foot. Wherever you may now be Jack: on with the dance.